Here’s another shot from the Big Morongo Canyon Preserve. Ironically, there were more birds in the parking lot area than we saw on the whole hike. 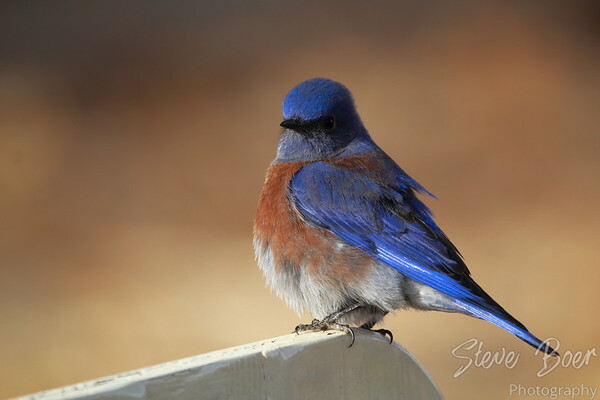 This western bluebird was looking very puffed up as he perched on the entrance sign to the hiking trails. Whenever I think of bluebirds, it always reminds me of a certain Gary Larson Far Side cartoon. There’s a sad-looking guy sitting on the edge of the bed in his dingy apartment with a chicken in the window. The caption reads “The Bluebird of Happiness long absent from his life, Ned is visited by the Chicken of Depression”.